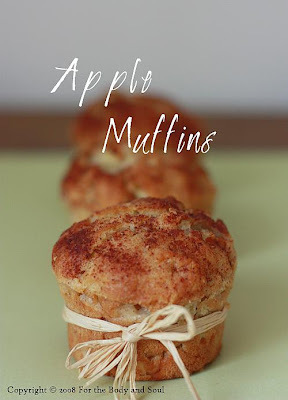 I chose a delicious apple muffin recipe to post today. The muffins are incredibly moist, soft and very aromatic with a nice touch of nutmeg and cinnamon. They aren't very sweet themselves, so the key here is to sprinkle some sugar on the top before baking. The sugar gets nice and crusty and tasty truly delicious. The recipe for these has somehow special meaning to me as these were the first muffins I’ve ever had in my life, and also the first ones I’ve ever baked myself. I was nineteen years old and I had just bought one of my first cookbooks ever, which happen to be entirely devoted to muffins. In Poland where I grew up, muffins have never been particularly popular and it was nearly impossible to buy muffin pans at that time, so I made them in tartlets molds (the same ones which I used for pistachio and raspberry financiers a few weeks ago ). The day I baked them my sister had guests. They loved my little baked goods so much that a moment later I was trying another recipe from the same book. I chose white chocolate muffins with some sliced almonds sprinkled on the top. They came out the same delicious and I still bake them often, so I’ll surely post the recipe here some day. According to the recipe this should make 6 large muffins. I use smaller muffin pan which usually makes sixteen. 1. Preheat the oven to 200°C (390°F). Grease or line muffin pan with paper muffin cups. 2. Peel and core the apples. Cut into very small cubes. (or grate). 3. Sift all the dry ingredients to a large bowl. Make a well in the center. 4. Heat the butter with honey over low heat until melted. 5. In a separate small bowl, mix together the eggs and milk. 6. Pour the egg mixture and the butter mixture into the well in the dry ingredients. Add the apples and mix. 9. Let cool slightly before removing from the pan. Serve warm or cold. Muffins, apples, cinnamon... Hmmm all the best for winter! You have some very beautiful pictures on your blog. Your food looks so nice. I love the blueberry pierogi. It is almost time for our annual pierogi making extravaganza for Christmas Eve. We make hundreds. So nice to be with family and have wonderful traditions. Do you make pierogi on Christmas Eve? I have been to Poland. I was in (unsure about spelling) Gidinia and Gdansk. Bal, thank you so much, it's such a nice surprise!! !